It doesn’t matter if you’re man or woman, gay or straight, dark- or light-skinned. All can equally submit guest posts to Modern Mormon Men. Write something now and submit via email. 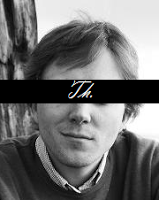 Theric Jepson writes about Mormon literature at A Motley Vision and other stuff at Thutopia. He co-edited Monsters & Mormons , recently finsihed his debut novel Byuck and can be blamed for other acts of wickedness as well. He lives in El Cerrito, California, with his wife. 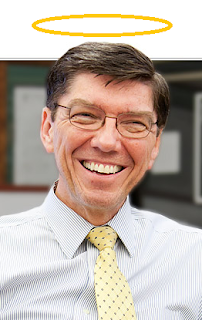 Unlike Orson Scott Card, Clayton Christensen is not a "Mormon artist"---but he is a famous public figure who is very open about the Mormon part of his identity. And no one wants to lynch him, so let's take a look, shall we? CC's on my mind for a few reasons. His latest book was just quoted in elders quorum by an artist, and his other latest book was just advertised to me via BYU Magazine. His most famous book is omnipresent and his BYU-I speech is one of my favorite sermons of the last decade. What's unique about the Mormon Church is that it encourages inquiry. I really do think my research and religion are all on the same page. I never could have come up with the notion of disruptive innovations, which went against a lot of conventional wisdom, if I hadn't been raised to always be asking questions. This correlates astonishingly well with my feelings about our shared faith, but not well at all with our public perception (cf Matt and Trey). Which, I think, is part of the reason the arts are treated so skeptically by many in the household of faith. CC can get away with saying a lot of what he says because he's a Proper Mormon Man: he's in business, he's rich, he's at Harvard, he's been an Area Seventy, he wears white shirts. The man has a credibility I'll never match. Not even a controversy-free Orson Scott Card could match that kind of credibility. Not even if he pulled a baby from a burning building on his way home from winning a Pulitzer. Anyway, it's Christensen's attitude toward seeking for knowledge that attracts me. That is an aspect of Mormonism that I think the world at large, in 2013, would find valuable. And so, to have a public Mormon espouse it---and as a basic tenet of his personal faith---is a marvelous and beautiful thing. The first Mormon man, may I remind you, became the first Mormon man by asking a question.